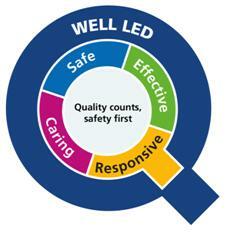 At our Trust, improvement really matters to us. We are always trying to make things as good as they possibly can be. We want our services and care to be of the highest possible quality. That’s why we’re kick-starting our campaign by focussing on these areas as our key themes. Quality must be the organising principle for our services. It is what matters most to people who use services and what motivates and unites everyone working in health and care services. Quality challenges remain, alongside new pressures on staff and finances. We know that to provide high quality, person-centred care we must be a well-led organisation committed to delivering safe, effective, responsive and caring services. At our Trust, we describe this as a “quality counts and safety first” approach consistent with the Five Year Forward View Shared Commitment to Quality (National Quality Board, 2015).